Yeah, but: Mechanic don't care. 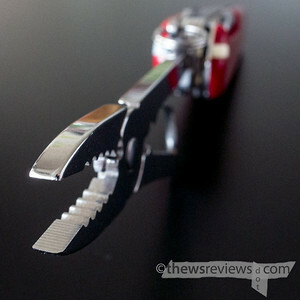 The Long Version: Why would someone want a small multitool that includes pliers, but not want a pliers-based multitool? It might sound silly, but it's a serious question. 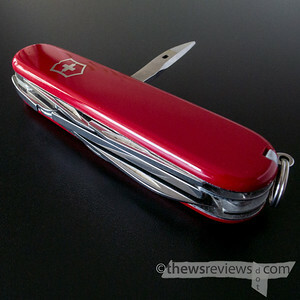 Without an answer to it, there's not much point looking at the Victorinox Mechanic, which is May's SAK Of The Month. Honestly, I'm not really sure of any reason why a Mechanic might be a better choice than a Leatherman or similar pliers-tool that also includes a knife blade and screwdriver. 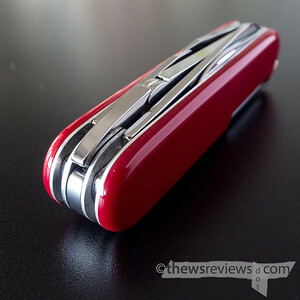 Many of them have cap lifters and can openers; some even include SAK-style tweezers. 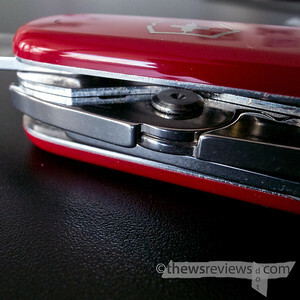 My Leatherman Style is smaller, slimmer, includes scissors, and its pliers are better. From a strictly practical point of view the Mechanic is a bit of a stumper. If I really need a pair of pliers then I'd probably reach for one of my four pliers-based tools, each in a different size, or – heaven forbid – an actual pair of pliers. While the jaws of the Mechanic are good, they're not good enough to beat the competition. No, the real advantage of the Mechanic over its competition is that it simultaneously does a stellar job of being a Swiss Army Knife. Swinging a small set of pliers out of a traditional-looking red cellidor SAK has a certain appeal. The Mechanic is a pretty cool knife. The Mechanic, as a SAK, has exactly the tools it should carry. There's two blades, large and small, as well as the can opener and bottle cap lifter with all of their assorted functions. Normally I'm happy enough to exchange the openers and small blade for a combo tool, as on the Bantam or Compact, but the Mechanic really deserves its dedicated tools. The cap lifter is a better slot screwdriver than the combo tool, and the sharpened edge of the dedicated can opener doubles as a scraper and staple puller, neither of which are something the combo tool is very useful for. I also prefer twin blades on any SAK that will do heavy cutting, as on the Electrician, so that I can use the short blade for most utility tasks and keep the bigger blade sharp for when its size makes a difference. Add in the backside philips screwdriver and awl and the Mechanic becomes a very useful tool to have for working-around-the-whatever. Pulling lightly-embedded nails, punching pilot holes and driving screws, prying, lifting, and cutting – this is a very helpful utility knife. Over just the past couple of days I've used the can opener to punch through and remove a plastic insert from the neck of a soy sauce bottle that was slated for recycling, the pliers to move something that was too aesthetically unappealing to touch, and the knife to cut stuff. No, I'm not exactly MacGyver's understudy, but I do okay. The Mechanic is a three-layer knife, but the pliers layer is the thickest on any SAK, so the total knife isn't exactly svelte. It's still a bit slimmer than the four-layer Explorer, and is still small enough that I'm willing to fit it in my jeans watch pocket, but it's right on the threshold. That stops the Mechanic from replacing my Tinker, which is the same tool set without the pliers, since there are times when it's more tool than I want to carry. But I do carry the Mechanic, and use its pliers, more than any of the pliers-based tools that I have. It may not objectively make sense, but the Mechanic is a pretty cool knife.